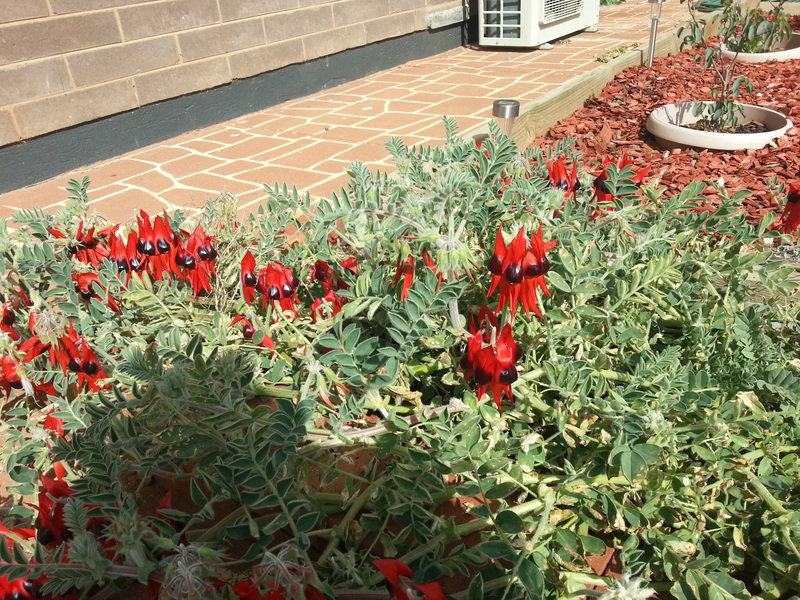 »House, Garden and Dogs»Hospitals,clinics and Sturt’s Desert Pea. Hospitals,clinics and Sturt’s Desert Pea. I do not have Wallabies and Kangaroos in my garden. I do have two dogs and the occasional wandering cat, which sits high on a fence and teases the dogs. I’m not a cat person, but she/he is a lovely creature. 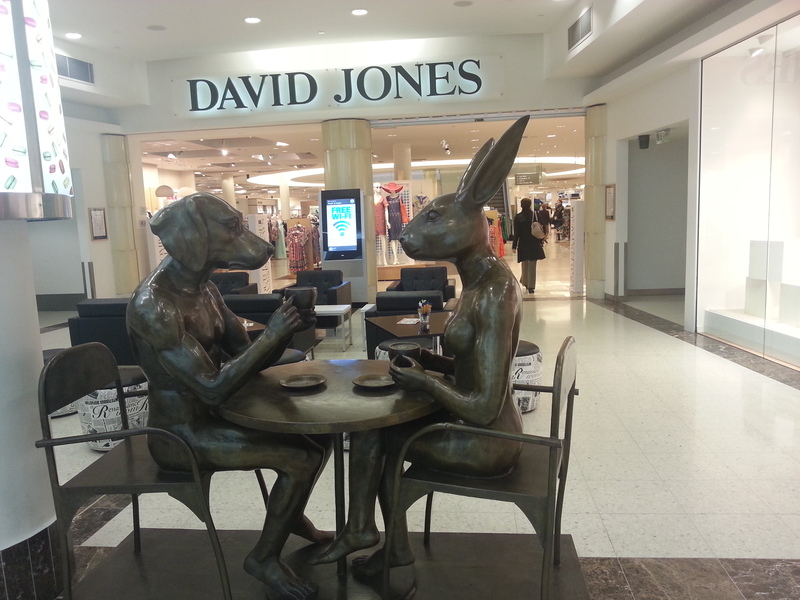 This week I head back down to Adelaide again. This will be – at least – one overnight stay, however, there is a possibility that it could be two, depending on how the meeting goes on Saturday. At this time of the year I will not make the long drive back home in the dark. The further north you go the more chance there is of wildlife on the road. If you hit a Kangaroo the damage to an ordinary vehicle would be extensive – perhaps not quite so bad in a Jeep, but still cost a dollar or three to get the repairs done. I was told that there is a device you can fit on the front of the vehicle that will deter a kangaroo from coming near you – emits a high frequency noise – or something. Must look into that. As expected the meeting went on until late in the afternoon and it was almost 5pm before I got back to the hotel. Fortunately they did have a room for me. There were some very contentious issues that were not entirely resolved and will have to be dealt with again at the next regular meeting in October. The space between will give people time to reflect on these issuses and, hopefully, come up with solutions. I arrived home Sunday afternoon and on Monday I was called into work – something I could really have done without. On Thursday I head off again to Royal Adelaide Hospital and take herself for tests. Not looking forward to this because she is not a good traveller and the tests will tire her, so even although the hotel is nice, she will be glad to get back home. Once back home I have to organise a fundraising event for the RFDS this Saturday. I think I have rostered myself on for that one and provided everything is ok, it should not be a problem. If it were summer I would be back home tomorrow night, since it would have been light until about 9:30pm. Anyway I kind of feel like John Denver ” All my bags are packed, I’m ready to go” and we take off shortly for the RAH. Her first appointment is not until 12:45 so that gives us enough time to get down there and get parked and make our way to the clinic. Depending on how she feels at the end of the day, we might have time to go into town for a little while. My son is staying here for a few days to look after the dogs. ← Now the Wallaby!! Sorry. Sounds like you really need to get off the road for a while! Good thoughts that the latest round of tests go well! Thank you – the latest round of tests went very well and we don’t have to go back until March 2015 – which is great. Yes, I would like a break from the road – even herself said this. I have one more in ten days then free until mid October.